Rachel’s brother Micah is a meth addict. She’d like to think he is getting better—after his stint in rehab, especially. But Micah never wanted to go to rehab, and he is back to using as soon as he gets home. Rachel’s parents had been unaware of his drug problems until Micah was totally out of control. And after rehab, they have no idea that he has relapsed. Should Rachel tell them what’s been going on? Rachel thinks that telling on Micah would be disloyal. She decides that things will get better. But then Micah disappears, and there’s no sign that he’s coming back. Rachel feels responsible. When she receives an anonymous email telling her that Micah is in the Ocean Beach area of San Diego and is pretty bad off, Rachel decides to take action. She lies to her parents about where she is going. She gets Tyler, Micah’s long-time friend and fellow band member, to search with her. Together, the two enter the underworld of meth addiction and homelessness. As Tyler and Rachel run into dead ends, they become closer to one another and share their own secrets. Rachel is getting over Keith, who had used and betrayed her. She’s falling for Tyler, but doesn’t know if he feels the same way about her or whether he is just being protective of his best friend’s younger sister. 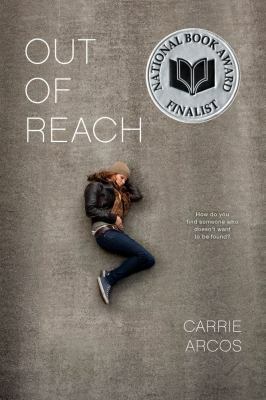 High school housekeeping: I picked up Out of Reach because it is a National Book Award finalist—that usually means that the writing is very good and the story engaging. The writing in Out of Reach follows a single pattern: Tyler and Rachel look for Micah. Rachel sees or hears something that triggers a flashback. She attempts to connect that flashback to the trajectory her and Micah’s lives have taken. To be honest, sometimes this worked for me, and sometimes it didn’t. Knocking out a flashback every few pages wore thin for me. I wanted the story to move forward, for something to happen. Additionally, sprinkled throughout the novel is a lot of information on meth addiction—again, this is useful stuff, but the story has to sit still while the facts are delivered. However, the book has many poignant moments. What Keith has done to Rachel is awful, but very realistic. And how Rachel’s family reacts to Micah’s addiction—‘walking on eggshells’—is also very realistic. Anyone who’ve had a drug addict or alcoholic in the family will relate to this. In a scene inside a Catholic church, Rachel also has some interesting reflections on life, death, rebirth and renewal. I’d love to hear about your experience with the book, especially the pacing. The Lexile level is 650—about a 5th or 6th grade reading level. The intended audience is high school students. This entry was posted in Adventure Stories, Family Problems, Fiction, Romance, Young Adult Literature and tagged book reviews, brothers and sisters, drug addiction, drug dealers in literature, family problems, meth addiction, methamphetamine, methamphetamine addiction, National Book Award Finalist, San Diego, YA fiction, YA literature. Bookmark the permalink.